Fluorescence microscopy images are plagued by noise and removing it without blurring vascular structures is an important step in automatic image analysis. The application of interest here is to automatically extract the structural components of the microvascular system with accuracy from images acquired by fluorescence microscopy. A robust denoising process is necessary in order to extract accurate biological information. For this purpose, we consider here a multi scale tensor anisotropic diffusion model which progressively switches the amount of smoothing and preserves vessel boundaries accurately. Based on a coherency enhancing flow with planar confidence measure fused with 3D structure information, our method integrates multiple scales for microvasculature preservation and noise removal from background membrane. Experimental results on simulated synthetic images and epi-fluorescence images show the advantage of our improvement over other related diffusion filters. 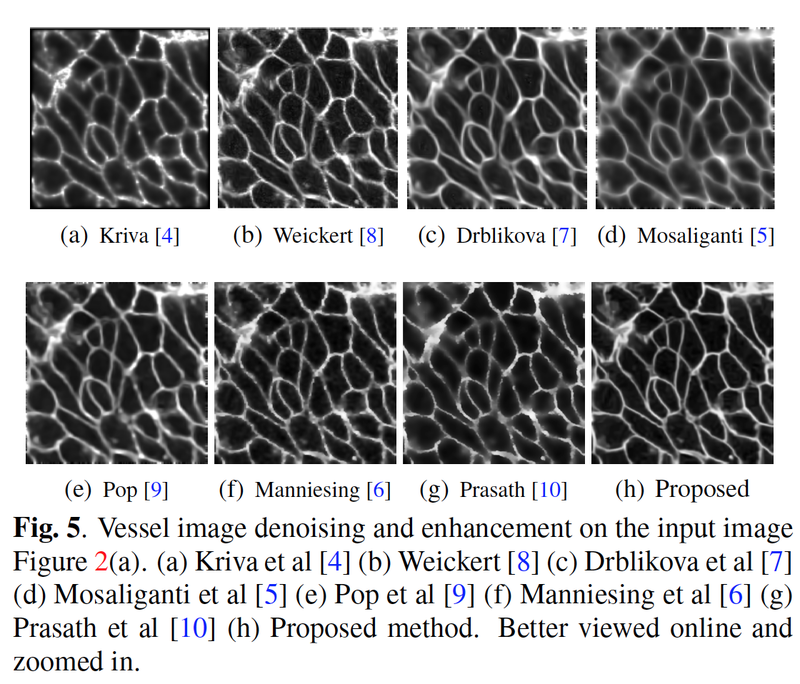 We further show that the proposed multi-scale integration approach improves denoising accuracy of different tensor diffusion methods to obtain better microvasculature segmentation. V. B. S. Prasath, R. Pelapur, O. V. Glinskii, V. V. Glinsky, V. H. Huxley, and K. Palaniappan. Multiscale tensor anisotropic filtering of fluorescence microscopy for denoising microvasculature. IEEE Int. Symposium on Biomedical Imaging (ISBI), pages 540-543, 2015.